Magic Circles 2 Mod. This version now allows full 3D object rotating, and circular arraying to any angle, or angle increment you want. Another great new addition to this version is that it comes with both a worldedit craftscript, and MCedit filter, allowing use in singleplayer, multiplayer and MCedit! 1) Install the SinglePlayerCommands mod, which also comes with WorldEdit. 3) From the .minecraft folder navigate to the mods folder then to the spc folder. 4) Copy the downloaded, unzipped folder “craftscripts” into it, merging with existing folder if necessary. 5) Find the worldedit.properties file in the same folder and open with any text editor. 6) Go to the line that reads “scripting-timeout=” and change the value to 30000. 7) Save the file and close all folders, open Minecraft and test it out with the command “/cs rotate”. 1) These scripts all require the worldedit plugin, make sure to have it installed before attempting. 2) Once installed you just need to copy all the script files to your “plugin/worldedit/craftscripts/” directory. 3) Make sure to increase script timeout value in the “plugins/worldedit/config.yml” file to at least 30000. There are three things you must do to run this script correctly. The first is setting an active 3D selection with worldedit, to the blocks you want rotated. 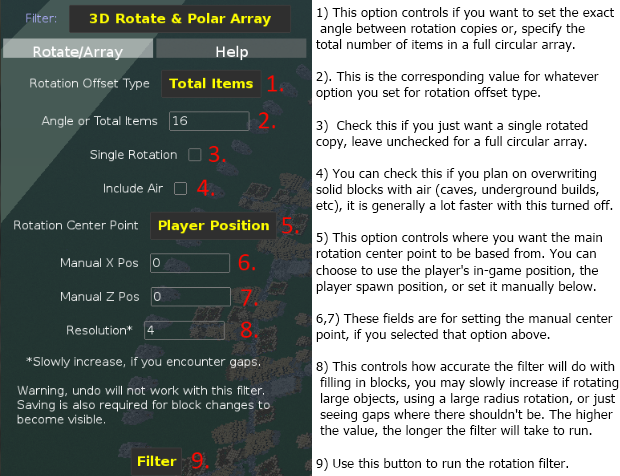 Once you have that, you need to bind the rotate brush to a non-useable item, with the commands listed below. Once the brush is bound all you need to do is click where the center should be, and it will copy, and rotate everything around that point. resolution – The accuracy of filling in blocks, slowy increment this if you encounter gaps in blocks. brushMode* – Specifies if the command should bind to a brush = 1, or run now, using player origin = 0. *SPC and worldedit brushes are somewhat unstable at the moment, setting this to 0 may prove to be more crash resistant if using this in singleplayer. Only the increment argument is required, all others are optional. Exclude commas when entering in arguments. 1) The first you need to do is open the directory in which mcedit was installed. 2) From there, navigate to the appdata folder, then to the folder of your current mcedit version. 3) In that directory there should be a filters folder with all the normal default *.py filters. 4) All you need to do now is copy the downloaded filter file into that directory. 5) The next time you open the filters menu up in MCedit, it will be on the list. There are a few things you must do to run this filter correctly. The first is setting an active selection in MCedit, to the blocks you want rotated. Once you have that, you need to open the filters menu up ,and locate the “3D Rotate & Polar Array” option on the dropdown list. Once you have selected that, the filter interface options will show up and let you rotate your selection by hitting the filter button.